These questions cover the chapters (scenes) of MONSTERVILLE: A LISSA BLACK PRODUCTION, in chronological order. For reading questions about the book that are more general, click here. Why does Lissa have such an attitude about moving to Freeburg? Do you sympathize with her, or do you think she’s overreacting? Did you find the scene where Lissa encounters the swamp monster scary? Why or why not? What are some of the monster movie rules Lissa thinks of when she encounters the monsters? Does knowing these rules help her? Why do you think Adam is so willing to help Lissa catch a monster? 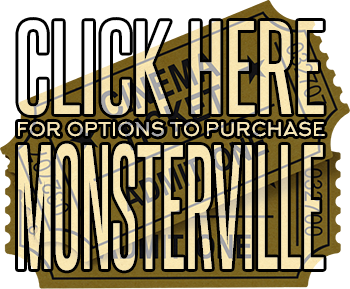 What does the Monsterville board look like? Would you have untied the monster Lissa finds in the snare? Why or why not? How does Adam try to get Lissa to adjust to Freeburg? Is it working? Is there anything about Monster’s personality that is unusual or non-monstrous? Were you surprised that Monster made friends with Haylie? Why or why not? (Were there any hints or foreshadowing?). If you were Lissa, would you have allowed Blue and Haylie to keep playing together? What are some of the advantages versus disadvantages? How do the monsters Down Below choose the kids they steal on Halloween? Why are those kids easier to take? Do you think Lissa is right that it might be better if Blue can’t remember his life from before he was taken? When Lissa and her mother go to Algonquin, Lissa notes that the move to Freeburg isn’t entirely awful. What are some of the reasons the move is good for the family? Why did Aunt Lucy design Monsterville? What is Candice like compared with Lissa’s two best friends (Casey and Taylor) back home? How does everyone at Lissa’s old school make her realize she hasn’t been forgotten? Do you think Adam and Lissa taking Blue trick-or-treating is worth the risk? Why or why not? Do you think Lissa could have done anything differently/better to prevent Haylie from being taken? Why do you think both Blue and Adam were willing to risk their own lives by going Down Below? How do Adam’s Boy Scout skills come in handy while the group is Down Below? How does Lissa’s monster movie knowledge come in handy while the group is Down Below? What are some examples of how the group members save each other when they are Down Below? Do you think the group would have made it to the Transformation Room if any of the three (Blue, Adam, and Lissa) hadn’t made the journey? Why or why not? How does Haylie help the group escape from Atticus? What about her personality doesn’t fit the “damsel in distress” stereotype? (i.e., the group comes to rescue her, but she’s not helpless). Why does the group not use the portal under Haylie’s bed? How is that supposed to make Colin/Blue transform back? Based on how the book ends, what do you think happens in the sequel?